Help your child learn to swim at an early age. Participants learn about water safety and basic skills to get them swimming independently. Your child has the opportunity to advance through three swim levels developed for their age group by the American Red Cross. We will teach your children at the level they are at and challenge them to continue to learn more. 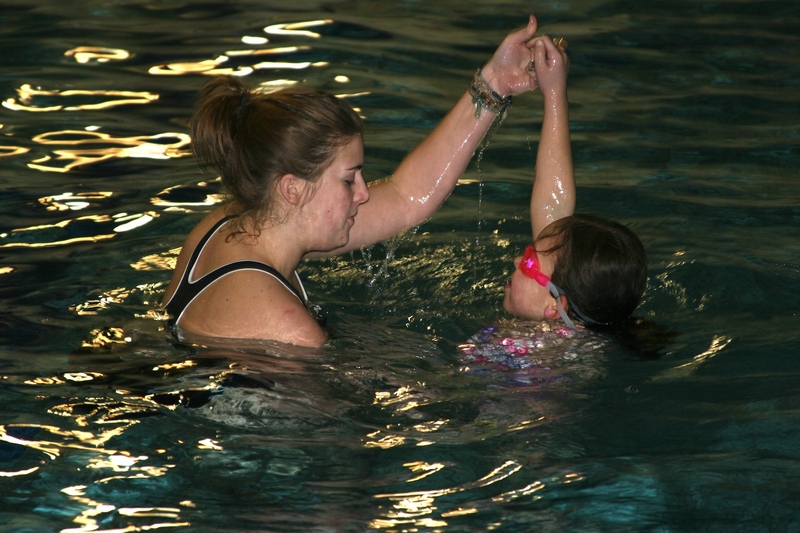 We also find that children with some swim skills help encourage other children to try and learn new swim skills. Swimmers will learn to not be afraid to put their head underwater, have forward motion when swimming on their front, and be comfortable swimming on their back independently. They will also learn how to do the front crawl, go underwater for objects, swim back crawl, float and glide. Children will learn water safety and swimming skills. These classes prepare kids to have independent fun in the water while giving parents peace of mind. Not only do these classes help prepare kids for upcoming water activities such as pool parties, but also leave them with life-long swimming skills. This class is also beneficial to kids thinking of joining our Sharks swim team. Participants must bring their own towel, bathing suits and a change of dry clothes. We would also encourage everyone to wear water shoes, flip flops or sandals to prevent slipping in the locker rooms or on the pool deck. Can swim freestyle and backstroke. Swim Lessons in May & June will be held at the Indoor Swimming Pool. Swim Lessons in July & August will be held at the Outdoor Swimming Pool.